A major concern for businesses registered under GST is to make sure they don’t lose out on the tax benefits and input credits of the old regime. These taxes may have been paid while purchasing, inputs, raw materials, semi-finished goods, finished goods, or on materials sent to job worker. For most businesses these taxes are available as input credit on 30th July. And moving these to GST regime is important to take benefit of them. The CBEC has released transition rules and formats and with the help of these, businesses can move credit of old regime to GST. 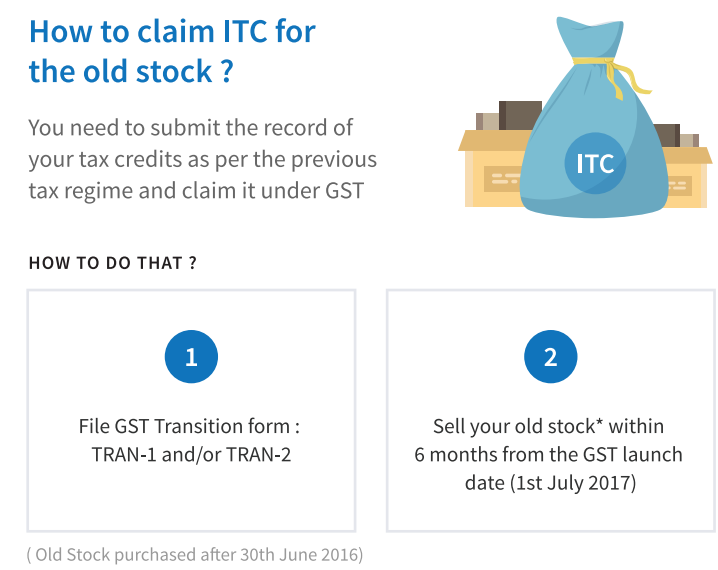 How to claim ITC on old stock? Which Form to choose? Earlier, Filing of TRAN-2 had been extended from 31st March 2018 to 30th June 2018. Any business having a closing stock -whether registered or not before GST, will be entitled to claim credit of tax paid under pre-GST regime. This claim of ITC also depends on few conditions which we will discuss further. To help businesses transition smoothly and carry forward their input tax credit, the CBEC has released 2 transition forms called TRAN 1 and TRAN 2. Both these forms can be filed on ClearTax. Note: TRAN 1 can be revised only once. After rectifying no further changes can be made. – Transition forms must be filed for each GSTIN separately. – Any credit that you want to carry forward from the old regime must be eligible credit under GST as well. – Accumulated credits of old regime can be taken to GST. This is allowed only when you have filed past six months returns under the old regime. So you must file old returns of VAT/ Excise/ Service Tax properly. 4. Confirm that you have submitted ALL the returns required under existing law for past 6 months– Answer is in the form of Yes/No. The closing balance of CENVAT/VAT credit of past returns can be taken as a credit in your GST electronic ledger only when you have filed returns for the previous six months under the old regime. a) Amount of cenvat credit carried forward to the electronic credit ledger as central tax ( Central Excise and Service Tax) Section 140(1) and Section 140(4)(a). Applicable for a registered person other than a person paying tax under composition scheme, who was registered under the old regime and has furnished the returns under the old regime. (Section 140(1) of the CGST Act). Input credit related to taxable supply where the registered person was providing/manufacturing both taxable as well as exempted service/goods under the old regime. (Section 140(4) (a) of the CGST Act). Such a person can claim excise and service tax input credit balance reflected in the return. Tax period to which the last return filed under the existing law pertains – give the period of the last return filed by you. Say for eg if you are an excise manufacturer you have to file monthly ER-1 and quarterly ER-3. Under this part, you provide details of both these returns filed for the past six months. ‘C Forms’ – C Form is issued by a registered dealer (purchaser) to a registered seller when an interstate sale is made. When purchases are made under a C form Central Sales Tax (CST) is 2%. 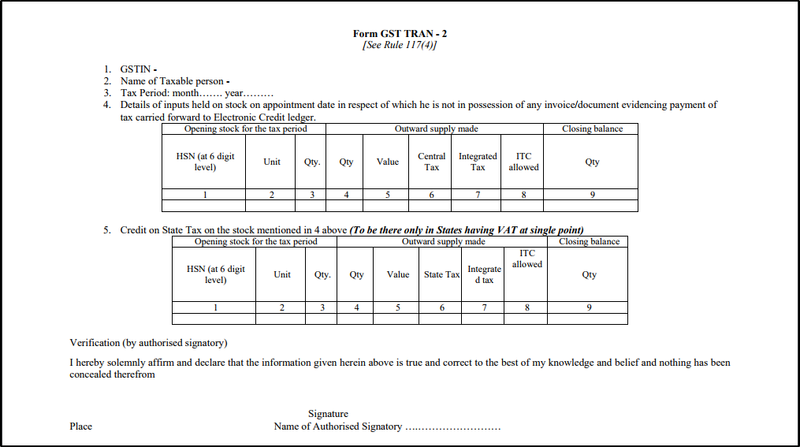 ‘F Forms’ – Are used for making branch transfers without paying tax. F Form is issued by the branch office/consignment agent receiving goods as branch/stock transfer to its head office/principal who is sending the goods. The Head office/Principal uses F forms to prove that goods sent are stock/branch transfer and not sale. ‘H/I Forms’ – used in case of Exports for local purchases made without payment of tax. This Form is issued when the buyer is an exporter and is purchasing inter state for exports. If the exporter/buyer issues H form, the seller is not required to charge or pay any CST on the transaction. c) Tax credit for State/UT Tax for pending C Forms, F Forms and H/I Forms (For all registrations on the same PAN and in the same State) – If you are registered under any State VAT & if you have any pending C-Form/F Form/H or I Form then you are required to pay the differential tax as you are not eligible to charge concessional CST rate.Such Differential tax payable will be deducted from the input tax credit balance available in the last return filed by you & the remaining credit will be carried forward under GST Regime. In column 2 state the closing balance of the input tax credit in the return filed for the period ending on 30th June 2017. In column 3 , 5 & 8 the Turnover for which the C-Form , F Form & H/I Form respectively are pending must be provided. Column 10 is calculated as follows :- Column No 2 – (4+6-7+9).This is the balance ITC of VAT/Entry tax that will be transferred to you under GST regime. 6. Details of capital goods for which unavailed credit has not been carried forward under existing law (Section 140(2)) – This requires you to provide details of any unavailed input credit pertaining to capital goods. Credit of taxes paid on capital goods is usually spread over more than one financial year. In case you were not able to fully claim input credit of taxes in full by 30th June, the remaining portion can be claimed by reporting here. Section 140(2) of the CGST Act basically refers to carry forward of CENVAT credit for capital used which was not carried forward in a return of the old regime. If a cenvat credit has been carried forward in an earlier return it will be included in 5a.mentioned above. In column 2 & 3 provide the Invoice number & date of the capital good. In column 6 provide the value of the capital good, in column 7 the Excise Duty or the CVD paid & in column 8 the SAD paid. In column 9, enter the CENVAT Credit which was eligible under the old regime. This amount cannot exceed the Total of Column 7 & 8. The CENVAT Credit already availed under the old regime must be provided in Column 10. Such amount cannot exceed the value in Column 9. 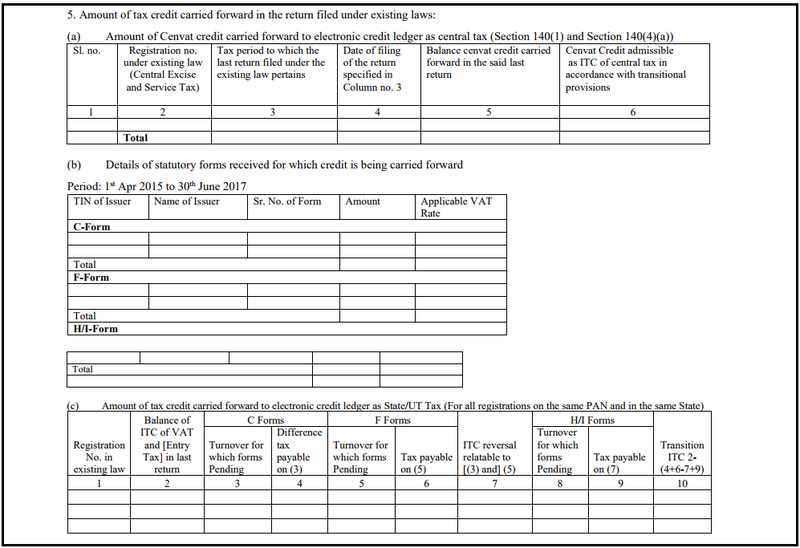 The balance unavailed CENVAT Credit i.e Column No 9 minus Column No 10 is the remaining or the balance CENVAT Credit eligible as ITC of Central Tax which is reflected in Column No 11. In Column 2 & 3 provide the invoice number and date of the capital good. In column 6 provide the value of the Capital Good ,in column 7 the VAT or the entry tax paid on the capital good. In column 8 , enter the total VAT and entry tax credit which was eligible under the relevant State VAT Act. This amount cannot exceed the Total of Column 7. 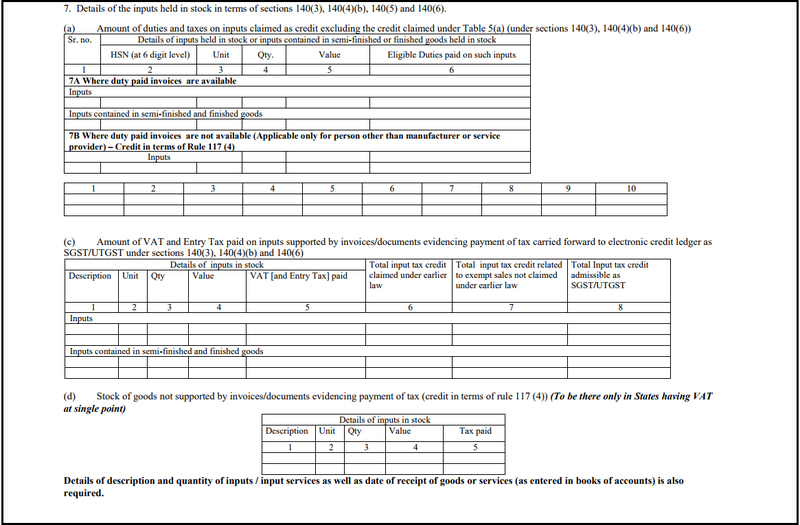 The Total VAT/entry tax credit already availed under the ols regime must be provided in Column 9. Such amount cannot exceed the value in Column 8. 7. Details of inputs held in stock in terms of section 140(3), 140(4)(b) and 140(6) – This section is for claiming input tax credit by a manufacturer or dealer who was previously unregistered and/or was dealing in exempted goods. This portion asks for details of inputs held as stocks. It also applies to a person who was manufacturing both taxable and exempted goods or providing taxable as well as exempt services. And tax in the stock/inputs which was used for exempted supply under old regime but is taxable under the GST. Also applied to a person registered as a composition dealer (paying tax at fixed rate or fixed amount) in old regime, but a normal registered taxpayer under GST. In short these are the persons who have stock as on 30th June 2017 but were unable to claim the credit of such stock through returns filed by them which are already mentioned in 5a.b. 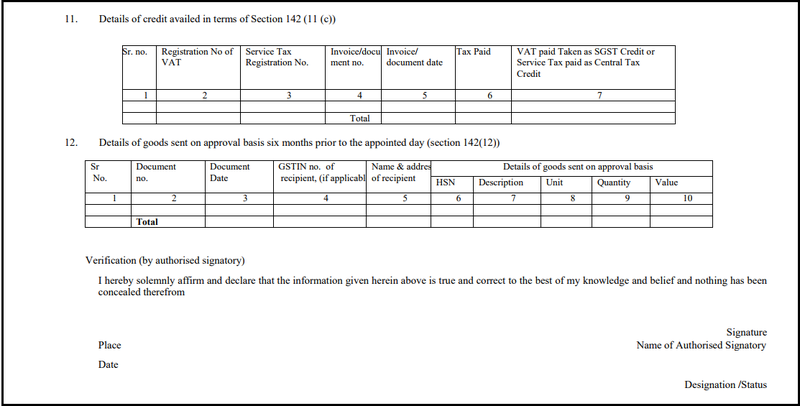 or c. of FORM GST TRAN -1 ( see above). Part 7A is Where duty paid invoices or other documents are available to be filled for inputs or for inputs contained in semi-finished and finished goods by a manufacturer or service provider to claim input tax credit of excise duty or service tax as input tax credit of CGST. Part 7B is to be filled only by those who are not manufacturer or service provider who was unregistered in the old regime – basically to be filled by dealers or traders to provide information of Inputs where duty paid invoices or documents are not available. Such a person also has to fill TRAN-2 which we will also discuss. b) VAT and entry tax paid on inputs or input services where documents of payment of tax are available and which will be carried forward as SGST/UTGST: Where input or input services are received on or after the 1st july 2017 but the duty or tax on the same was paid by the supplier under the old regime. Registered person can take credit of eligible duties and taxes paid by them when the invoice has been recorded in the books within 30 days from 1st July. (The period can be extended by the Commissioner GST by another 30 days). This situation is covered under section 140(5) of the CGST Act & the following details must be submitted. The invoice number & the invoice date must be filed in column 2 & 3 respectively. In column 4-7, the details of such supply that is the description, the quantity(if goods), the unit of measurement(if goods), & the taxable value must be provided. In column 8 the eligible duties must be entered. In column 9 the VAT/Entry Tax in such goods must be entered. In column 6, the total input tax credit already claimed under the old regime must be entered. In column 7, the input tax related to exempt sales (old regime) but taxable under GST must be filed.This input tax credit would not have been claimed the old regime & it is eligible now if such goods are taxable or where a composition dealer in old regime is now registering as normal taxpayer. This portion must be filled if you are trader or dealer who is unregistered under the old regime and where you do not have the invoice or other prescribed documents evidencing payment of VAT/Entry Tax which will be claimed as ITC of SGST after filing FORM GST TRAN – 2. Please note that a manufacturer or a service provider cannot fill this table. Also this applies to states where the VAT need to paid at the single point. (i.e tax is paid by the manufacturer or the importer only ) like in Punjab. 8. 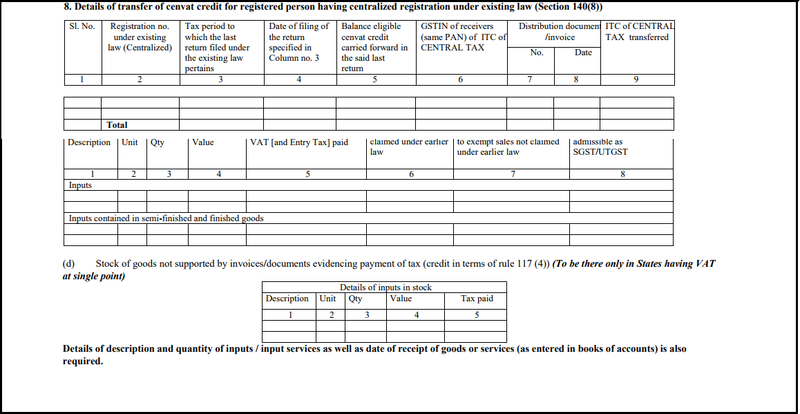 Details of transfer of cenvat credit for registered person having centralized registration under existing law (Section 140(8)) – This is applicable for transfer of input tax credit related to service tax. A document must be issued in order to distribute the credit. The document number must be mentioned in column 7 & the date of such document in column 8. In column number 9 mention the input tax credit of central tax transferred to each branch.The total of column 9 cannot exceed the total of column 5. Provide the GSTIN of the job worker if he is registered under GST. In column 5-9 provide further details the HSN Code of the good held with Job worker, the description , the unit of measurement for eg: kgs , boxes, tonnes , the quantity, and the value of the stock. Provide the GSTIN of the Principal if he is registered under GST. 10. Details of goods held in stock as agent of behalf of the principal under section 142(14) of the SGST Act. (iii) the invoices for such goods or capital goods had been issued not earlier than 12 months prior to 1st July 2017. (iv) the principal has either reversed(if anu input tax credit claimed by him) or not availed the input tax credit for such goods or capital goods. Provide the GSTIN of Principal in Column 2. In Column 3-7 give the details of the stock held by you like the the description , the Unit of measurement for eg kgs, boxes, tonnes , the quantity of held by you & the value of the stock and the input tax on the same to be taken by you. In Column 3-7 give the details of the stock held by you like the description , the unit of measurement for eg: kgs, boxes, tonnes, the quantity held by you, the value of the stock and the input tax on the same to be taken by your agent. This is for works contractor where both VAT & Service Tax is paid by him on any supply, then GST shall be leviable & he shall be entitled to take credit of VAT & Service Tax paid by him to the extent of supplies made after 1st of July 2017. Invoice number & Invoice date in Column 4 & 5 respectively. In column 2 the document number on the basis of which the goods are transferred. In column 3 document date, the date on which the goods are sent. In column 4, GSTIN of recipient of goods if it is applicable. In column 6-10 – details of such goods like the HSN Code , the description of the goods, the unit for example Kgs/Mtr, the quantity of goods transferred and finally the total value of goods sent. 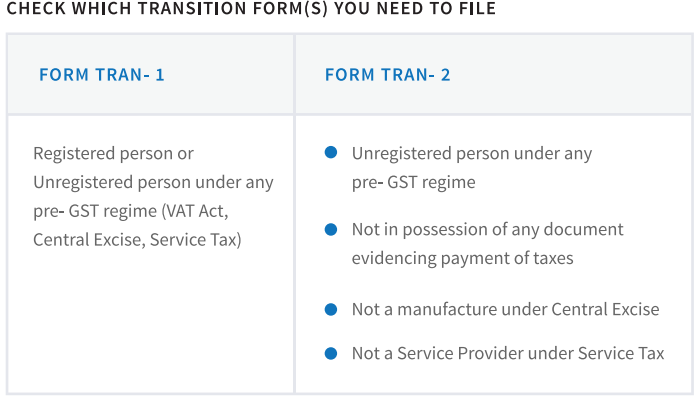 Form TRAN – 2 can be filed by a dealer/trader who has registered for GST, but was unregistered under the old regime. Such a dealer who does not have a VAT or excise invoice for stocks held by them on 30th June 2017, can use TRAN -2 to claim tax credit on the stock with them. 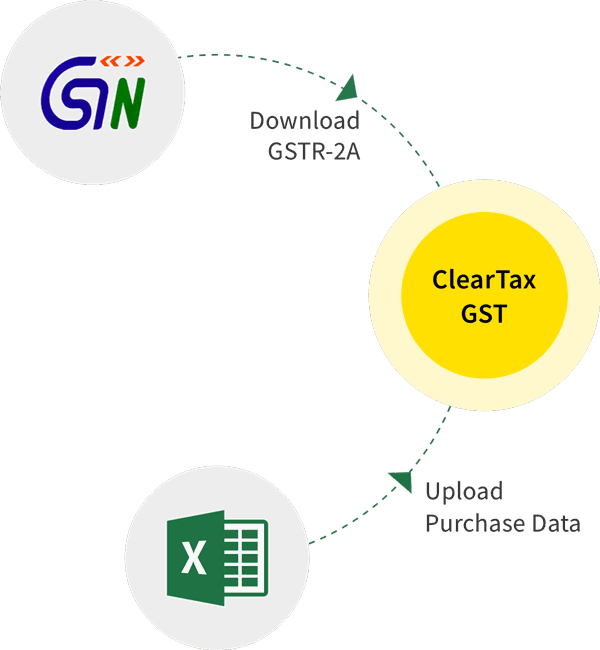 A manufacturer or service provider cannot file Form GST TRAN – 2. Such goods were not unconditionally exempt fully from excise/VAT or were not nil rated goods under Excise/VAT. This scheme is operative only for 6 months from the 1st of July 2017 which means that the stock must be cleared by the end of December to claim the credit. You have a document that shows procurement of such goods. The stock of goods on which the credit is being claimed is stored such that it can be easily identified. 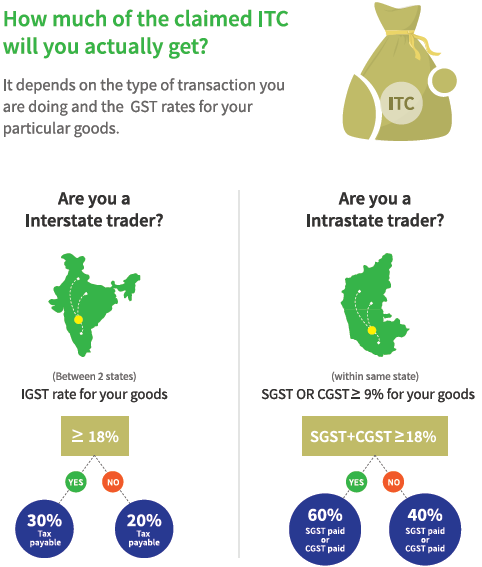 In column 7, if goods sold are sold inter state, then the amount of IGST paid must be mentioned. ITC for capital goods is not available to the taxpayers under pre-GST regime 100% during the purchase of such goods. In case a registered person has purchased the capital goods and was not able to claim the total amount of tax paid on purchase, the remaining ITC can be claimed under GST. When a principal manufacturer has sent his goods for job work to the job worker and such goods are lying with the job worker as on 1st July, it is also a stock held by principal manufacturer on which credit of tax will be allowed. When a principal dealer or manufacturer has sent his goods to his agent or consignment dealer for sale and the stock still lies with the agent or consignment dealer as on 1st July, it is also a stock held by principal dealer or manufacturer on which credit of tax will be allowed. The registered person under GST will be allowed the credit of tax paid on purchase of goods and held in closing stock as on the appointed date. Since, it is not in in possession of an invoice or other documents evidencing payment of taxes under VAT Act, Central Excise, credit will be allowed based on rate of IGST, CGST and SGST of the closing stock under GST according to the HSN code. When the taxpayer sells the goods held as closing stock as on 30th June, he will have to first pay the appropriate taxes on such outward supply and then he will be allowed the ITC based on the rate of tax paid for that outward supply. Conditions to be fulfilled to claim credit of Central Tax and State tax- Applicable in case of States offering Tax on MRP Scheme. The central tax or state tax payable on such supply has been paid. such goods were not wholly exempt from Excise Duty or Nil rated or under the relevant State VAT Act. the document for procurement of such goods is available with the registered person. amount of credit allowed shall be credited to the Electronic Credit Ledger.